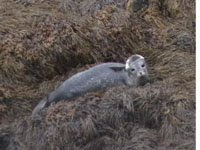 It's midsummer and we have just heard the seals singing off Holy Island in Northumbria – a huge chorus of dozens of grey seals gathered on a shingle spit across the bay. It was the most haunting and unearthly sound I have ever heard in my life. Completely overwhelming. That is very interesting. If you ever have a chance to record them, I'd love to hear it. My own recording attempts have met with repeated frustration. Maybe they don't want to be recorded! I have just returned from a walk along the shingle spit of Blakeney Point in Norfolk, UK. The permanent grey seal population there certainly sing and they were all in good voice today in the morning sunshine. I'm amazed as to how far the voices travel too. I have just returned from Orkney and whilst standing at a shoreside graveyard heard, about 80m away, a colony of seals singing. A first for me. One of the most wondrous things I've ever heard. I did wonder if they were responding to the wonderful unaccompanied voices coming from the very small church. Two helpings of soul food in one morning.